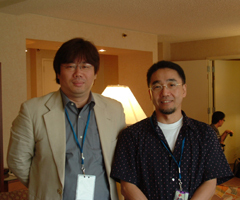 At Otakon 2005, Anime Secrets had the great and unexpected pleasure of being able to conduct an interview with character designers Kanemori Yoshinori and Kawamoto Toshihiro. Profiles of these two esteemed individuals can be found with the transcriptions of their respective panels linked above. This interview transcription includes questions posted by everyone present at the press conference style round robin, not just questions posed by the Anime Secrets representative. 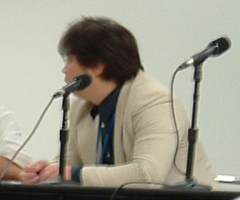 Kawamoto Toshihiro has been involved in the production of some of the most beloved anime that exist. Born on July 15, 1963, Kawamoto-san became an avid Gundam fan, and got his start in the industry at a studio that worked on Urusei Yatsura. Since then, he has been a pivotal part of projects such as Mobile Suit Gundam 0080: War in the Pocket, Mobile Suit Gundam 0083: Stardust Memory, Mobile Suit Gundam 0083: The Last Blitz of Zeon, The Vision of Escaflowne movie, Wolf's Rain, Golden Boy, and perhaps the most famous works in America:Cowboy Bebop and Cowboy Bebop: Knockin' on Heaven's Door. Most recently, Kawamoto-san served as the animation director for an episode of Kurau: Phantom Memory However, his most popular work may be still to come, as he is involved with the Fullmetal Alchemist movie.